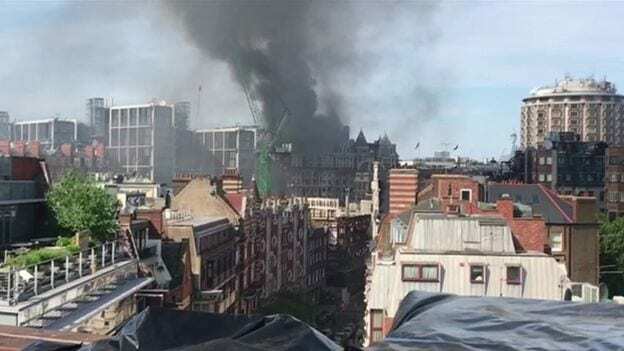 A huge fire has broken out across the roof of one of London’s top hotels Wednesday, just days after it announced the completion of a multi-million-dollar renovation project. More than 100 firefighters were sent to tackle the fire at the five-star Mandarin Oriental hotel, in the exclusive district of Knightsbridge. Plumes of thick, black smoke were seen billowing into the air above Hyde Park, as traffic in the area was brought to a standstill. Roads in the area were closed while the emergency services responded to the fire and train services have been disrupted. The hotel had recently been undergone a major refurbishment, the most expensive in London, redefining opulence in London and upgrading its 181 guest rooms and suites. A Mandarin hotel group spokeswoman said that work on the building was still being carried out. While there were some guests staying in the hotel, it is believed they had “all been evacuated,” she said. Thank you for your messages and for thinking of us. The situation at Mandarin Oriental Hyde Park is still unfolding. We will provide an update once we have more information to share. Can’t emphasise enough how well the evacuation operation as been put together, now being moved to a nearby hotel for safety! Seems like fire is out, helicopters circulating, crowds watching in fascination. More News as it breaks.